It is nearly 20 years after the Trojan War and Ithaka is still without its king, Odysseus. Anarchy reigns, as numerous suitors vie for the hand of his wife, Penelope, while ravaging his household goods and disrespecting his memory, and his son, Telemachos, is helpless to prevent them. Has our hero perished in his quest to reach his homeland, or is he still alive somewhere, struggling to reach home? The Odyssey begins in media res, or in the middle, where Odysseus is near the end of his journey, becoming shipwrecked on the land of the Phaiakians. These people, who we learn are very close to the gods, give Odysseus an audience for the retelling of his story and the various adventures he has experienced, while attempting to return home from the battlegrounds of Troy. From a violent assault on the land of the Cicones, to narrowly escaping a drugged existence in the land of the Lotus-Eaters, Odysseus endangers his men by deciding to stay in the land of the Cyclops in hopes of gaining host-gifts, and they must set to perilous flight. Poseidon, angered at the maiming of his Cyclops son, Polyphemus, plots their suffering and Odysseus and his men must endure captivity by Circe, an island goddess; a trip to the land of the Dead; a narrow escape from the Sirens, Scylla and Charybdis; and further imprisonment by the nymph, Calypso, lasting seven years, before he is released and lands on the island of the Phaiakians. 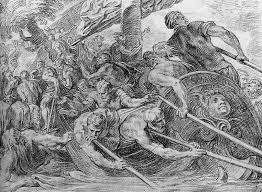 Yet, mainly because of the rage of Poseidon, but due also to Odysseus’ and his men’s misguided judgement, his whole crew is killed on the way home and he is left to continue the final part of his journey alone. 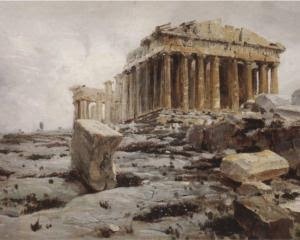 Fame and glory, or in Greek, kleos, are the most important values in this society. It appears that the suitors can disrespect and commandeer Odysseus’ household, only because there is no story attached to his fate. If he had died fighting in Troy, and therefore receiving a generous helping of fame and glory, this inheritance would have passed down to Telemachus, which would have engendered a reverence and respect among the people. It might not have prevented a few of the more aggressive suitors attempting to utilize their power, but Telemachos certainly would have received more support and sympathy from other Ithakan families. Gifts and spoils are another aspect of fame and glory. The more one acquires, the more renown is added to their reputations. This perhaps explains why Odysseus pours on the charm with the Phaiakians, who bestow on him more gifts than he could have won at Troy, then taxi him to Ithaka, unaware that they have angered Poseidon, who turns their ship to stone in the harbour on their journey back. The guest-host relationship, or in Greek, xenia, is another aspect of Greek culture unfamiliar to modern readers. If a guest visits your house, you are required by the tenets of hospitality to give him food and shelter. These acts are even more important than discovering his name and peoples, as we often see this information offered after the initial formalities are served. The concept of xenia is emphasized because one never knows if one is hosting a man or a god. As a modern reader, it was amusing to see poor Telemachos attempt to extricate himself from Menelaos’ hospitality and avoid Nestor’s, in an effort to avoid wasting time in the search for his father. I’m certain amusement wasn’t Homer’s intention but it wasn’t surprising as to the emphasis placed on this tradition. Any deviation from this custom could result in dishonour and a possible feud with your potential host or guest. Greek literature has been a surprising passion of mine. From my first read of The Iliad, I was hooked and I often wonder why? The heroes are chiefly concerned with fame, glory, reputation, pillaging and the spoils of war; the gods are jealous, capricious, vindictive and possess far too many human traits for comfort. Yet I think what draws me to these characters is that they are so real …….. fallible, vulnerable, imperfect, yet they exhibit these deficiencies through an heroic, courageous and larger-than-life persona. They have their customs and traditions, institutions designed to help their society flourish, and which are important enough to sacrifice happiness, comfort and, at times, even their lives, to preserve. A note on translations: if you plan to read only one translation of The Odyssey, I would highly recommend Richard Lattimore’s translation, as it is supposed to be closest to the original Greek, while also conveying well the substance of the story. Fitzgerald is adequate but likes to embellish, and the Fagles translation …….. well, as one learned reviewer put it, “they are so colloquial, so far from Homeric that they feel more like modern adaptations than translations.” I would have to agree. Eurykleia announces to Penelope of her husband’s return, yet Penelope calls her crazy and laments that she is torturing her. Eurykleia claims she is speaking the truth; Penelope believes, then does not believe her again. When she descends and sees Odysseus, she produces the same pattern of vacillating feelings, until Odysses produces knowledge of the construction of their bed, the frame built around an olive tree, and her resistance crumbles as she throws herself into his arms. She confesses that she had always been afraid of tricks from the suitors and that was the reason she felt it necessary to always keep her guard up. They go to bed, make love, then afterwards fall into conversation, as Odysseus tells her of the prophecy of Teiresias and of the stories of his voyage home. Waking in the morning, he informs her that he is going to visit his father on his estate, but he is also concerned that a rumour of the death of the suitors may have spread and instructs her to stay in her upper chamber. He leaves with Telemachos, the swine and oxherd, and as they leave the city, Athene covers them in darkness. What a lovely reunion between Odysseus and his wife! Although she oscillates between disbelief and belief, I think her reaction is sincere; she truly has been afraid of tricks from the suitors, yet her dearest wish is for her husband to return home. Her greatest wish and her greatest fear together vie for supremacy in her mind, and is it no wonder that she cannot reconcile her feelings and make a reasonable judgement? Hermes summons the souls of the suitors and “they followed, gibbering,” as he leads them to Hades. There, a number of Greek heroes appear, including Achilles and Agamemnon. Achilles laments that Agamemnon was cut down in the prime of his life and experienced a “death most pitiful”, when he could have died in the land of the Trojans. Agememnon reciprocates with a narrative of the funeral of Achilles. When they see the souls of the suitors, they are astounded, and Agamemnon questions Amphimedon, who appears to give an accurate accounting, but puts the blame on Penelope for her “planning out death and black destruction.” He also criticizes Odysseus’ treatment of them after their death. Amusingly, after Amphimedon’s elaborately long story, Agamemnon only remarks on the wonderful loyalty of Penelope. 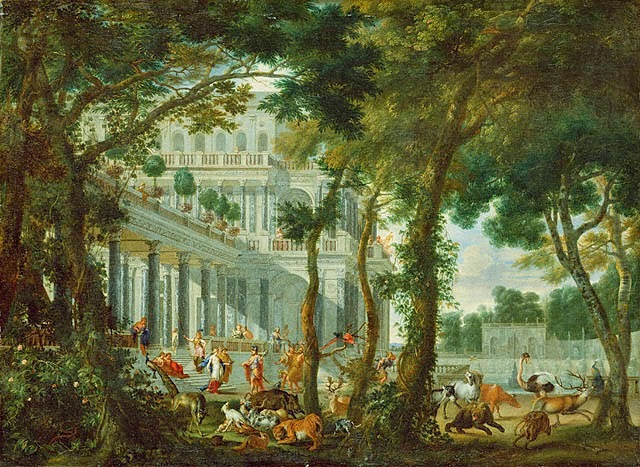 As this is happening, Odysseus and his company arrive at his estate and find his father in the orchard. Odysseus ponders whether to announce himself outright, or “to make a trial of him and speak in words of mockery.” He decides the latter. Chiding his father for his ragged appearance, he then pretends that he has encountered Odysseus in another country, and offers another extravagant lie as to his history. When his father begins to groan and lament, he finally reveals himself. Laertes, like Penelope, is at first sceptical, whereupon Odysseus shows him his scar. His father hugs him with joy but then expresses fear at repercussions that must come because of Odysseus’ actions. They go into the house where Laertes is bathed and anointed, then appearing like an immortal god; he laments he did not take part in the battle against the suitors with his son. Meanwhile “rumour” is flying through the city and Eupeithes, the father of Antinoös calls for revenge, yet Medon says that Odysseus’ conduct was with the approval of the gods, throwing fear into the assembly. Halitherses reasons that the suitors’ own actions brought on the terrible tragedy, bringing half the crowd to his side. Athene asks Zeus for advice and he judges that Odysseus’ actions were proper, and that it is time for friendship and peace. Athene flies down in the form of Mentor, as Odysseus sees men approaching the estate and cautions Telemachos not to “shame the blood of your fathers.” Athene gives Laertes an uncommon strength and he is able to throw his spear right through the helmet of Eupeithes. 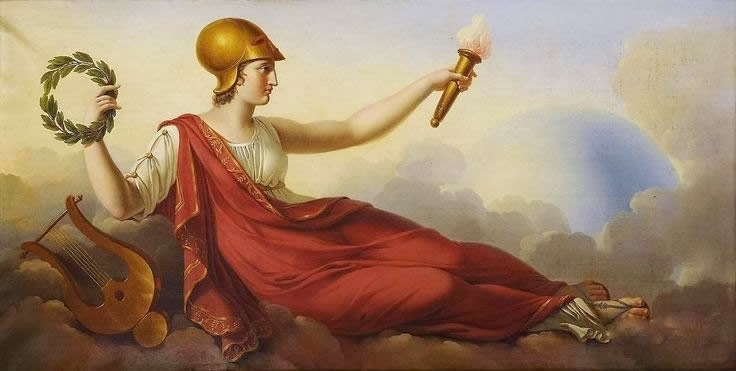 The parties fall to fighting until Athene stops them, calling for a cessation from “wearisome fighting” and claiming that “without blood, you can settle anything.” Recognizing the goddess, the men flee towards the city. Odysseus makes to follow, but Zeus throws down a thunderbolt and Athene commands him to stop the quarrelling. So pledges were sworn on both sides, settled by Athene, and we can assume Odysseus lived and prospered until his death, as foretold by the prophecy of Teiresias. Will the deception of Odysseus never end? I could not believe he chose to tease and “play with” his father, after all the poor old man had been through. However, he called his actions a “trial” so perhaps he felt he still needed to establish the loyalty of whoever knew is true identity. The contest and therefore, the beginning of the slaughter of the suitors, is begun by the history of the backstrung bow. It was given to Odysseus by Iphitos when they had met trying to retrieve their sheep and horses from the men of Messene. Odysseus had left it behind in Ithaka when he went to Troy, and in his household it had remained. Penelope retrieves the bow, announces the contest to the suitors and then places it in the hands of Eumaios, who is weeping when he sees it in remembrance of his master. 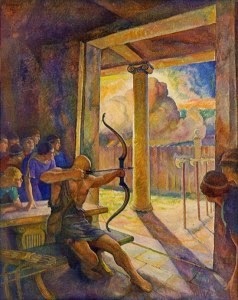 Antinoös derides him, and then admits that the bow will be hard to string, as he reminisces about Odysseus’ strength. Telemachos announces that he will be part of the contest and, if he wins, his mother will be able to remain in his house. He sets up the axes, making them perfect, although he has never done this task before, then picks up the bow, sending the string singing three times before Odysseus stops him at the fourth by making a signal with his head, and Telemachos encourages a suitor to come and test his skill. Antinoös determines the order in which they will proceed, and Leodes is the first to try, a man disapproving of the suitors’ actions. He fails, so the suitors decide to heat the bow but even then, they are not able to string it. Meanwhile, Odysseus meets Eumaois and the oxherd, Philoitios, outside the courtyard and, based on their unwavering loyalty, decides to reveal his identity to them. They are overjoyed and there is lots of kissing. He gives commands to both: to Eumaios, to put the bow into his hands and then tell the serving women to bar the doors and not to open them if they hear crashes and outcries; to Philoitios to make fast the courtyard with a bolt. In the meantime, Eurymachos finds he is unable to string the bow and is distraught, yet Antinoös chastises him, saying that of course they cannot string the bow on a holy feast day, and that they must try again tomorrow. Odysseus states he would like to attempt the feat that day, but the suitors are alarmed in case of his success, and issue threats if he is able to string it. Penelope chides them for their rudeness, stating the impossibility of her becoming the wife of “the stranger” but Eurymachos argues that their reputation is at stake, and finally Telemachos intervenes, sending his mother back to her house. Eumaios tries to carry the bow to “the stranger” but the suitors are so vehement against him, he drops it. Telemachos exerts his will and it is finally handed to Odysseus. 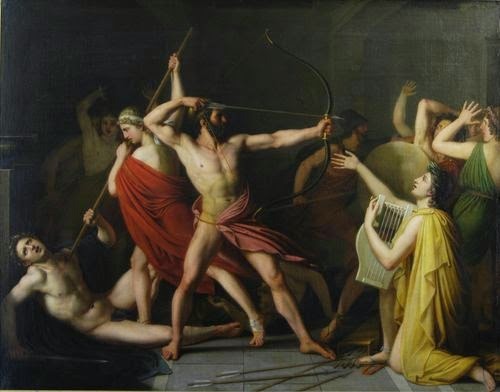 Eurykleia and Philoitios carry out their orders, while Odysseus strings the bow and makes it sing, sending an arrow through all twelve of the axes. The suitors are made even more uneasy, not only by the bow itself, but at the possibility of “the stranger” being able to best them. Antinoös, though he is full of hot air and bragging, seems to avoid even attempting the feat and later makes an excuse that it’s because it’s a holy feast day that none of them can succeed. The first people to whom Odysseus chooses to reveal himself, are two servants, Eumaios and Philoitios, a swineheard and an oxherd. What a surprise! ……. Or is it? One of Odysseus’ self-given tasks is to find who he is able to trust in his household and from that, whom he will kill and who will survive. Both servants have shown a steadfast devotion to their master and therefore, perhaps deserve his confidence. There are more and more instances of Telemachos showing a governance and mastery of his household. 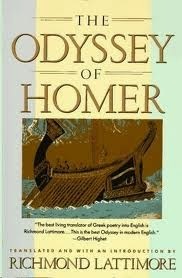 We understand the grudge Odysseus carries towards the suitors, but his anger towards the women was explored more in this book. Their crime appears to stem from their immorality and their mutiny against the household. Both Eurykleia and Telemachos state that they refuse to listen to him or his mother, and that they have taken to sleeping with the suitors. I’m not clear if the judgement of immorality is based on a cultural standard, or if it is because they are sleeping with enemies of Odysseus. Upon viewing the slain suitors, their reaction was weeping and wailing, so their treachery was quite apparent. Note: The last sentence of this book: “He recognized all these women,” is very telling. That would mean that all the women would have had to be over 20 years old (probably 30 or more likely, 40). It appears all the young women were the immoral ones, and the older ones were the ones who remained loyal and steadfast. This is, perhaps, another example of the breakdown of societal conventions due to Odysseus’ absence, and the lack of leadeship on the island. We witnessed a rather gory end to these young men. Should Odysseus been more temperate and spared more of them? I tend to think not. He will have enough to deal with, trying to explain his actions, and to leave one alive if he is not completely certain of his loyalty, could have been quite dangerous. If one of them appeared loyal at the palace and then later began to stir up dissent in town, his actions could undermine Odysseus’ position. Sadly, I think out of necessity, they all had to perish. I wonder if any of these suitors had known the real Odysseus, if they would have dared to behave the way they did. My guess is no. Ordering Eurykleia to get the women into the house, Telemachos and his father proceed to store away all the weapons. Afterwards Telemachos goes to bed, but Penelope descends from her chamber, wishing to speak with “the stranger”. Once again Melantho harps at Odysseus and he has harsh words for her, but Penelope, catching their conversation, scolds her maidservant and sends her away. Sorrowfully she confesses to “the stranger” how she has avoided marriage for the past three years, but now she feels that she can delay her fate no longer. 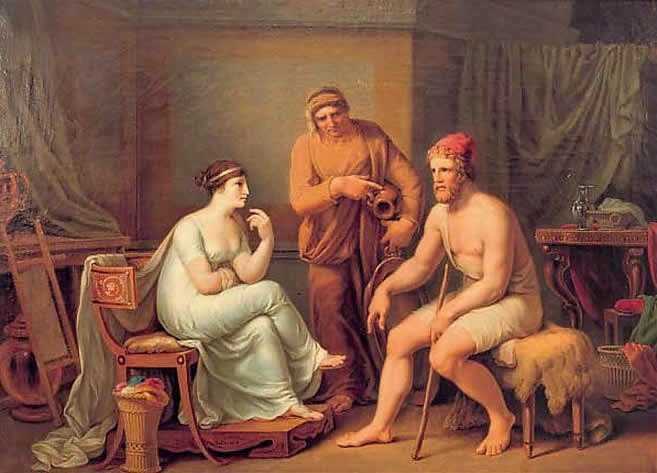 Odysseus requests that Penelope not ask for his history but she ignores his entreaty and, seemingly against his will, he must weave an elaborate lie to placate her curiosity. When he tells her of Odysseus’ return however, if spite of his apparent sincerity, she does not believe him, She offers him a bath in the morning yet he will accept only if an old woman with as many sorrows as he, will give it to him. Penelope sends him Eurykleia, his old nurse, and to his consternation she recognizes a scar he received on his leg from the tusks of a wild boar when he was just a young boy. Wild with joy, she makes to summon Penelope but Odysseus stays her with rather harsh words. Professing her loyalty, she leaves and returns with a new basin of water and proceeds to wash him and anoint him with oil. Then Penelope speaks with him again, admitting to her indecision over her course with the suitors and then requesting that he interpret her dream: she had twenty geese that fed on wheat and a great eagle came and broke the necks of all of them. The eagle returned, claiming to be Odysseus and the geese the suitors. Once again Odysseus tries to convince her of his return and the suitors’ destruction, but she then prevaricates, stating that some dreams are true but others only deception, and she believes her dream the latter. Tomorrow she will set up a contest between the suitors and whoever can send an arrow through twelve axes set up in order, that is the man she will marry. She retires to her chamber to weep for Odysseus. How believable is Penelope’s disbelief? She has had numerous tales of Odysseus’ return, yet she absolutely refuses to lend them any credence. One would think she could at least send out servants to try to confirm or deny the stories, but it is as if she has given up long ago and the only way she is able to survive is to believe the worst and attempt to deal with it. 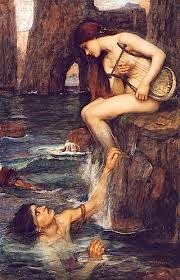 It is not surprising that Eurykleia is able to recognize something of Odysseus in “the stranger”, yet Penelope cannot. She has already abandoned hope. We have seen many portents throughout this poem, which always seem to need to be read by someone. The omen of the eagle and twenty geese perhaps is not difficult to interpret. I also thought that the 20 geese could symbolize the 20 years that Odysseus had been away and the sudden appearance of the eagle, his sudden return. Rather shockingly, in the dream, Penelope likes her geese and cries sorrowfully when they are slaughtered. Does this mean she likes the attentions of the suitors? Is her claim of delay a ruse to continue their behaviour, which may possibly stroke her ego? However he is not pleased to deceive his wife, although when she persists, he does lie to her, as he finds it necessary to do so. Sleep evades Odysseus as he agonizes over the suitors’ treatment of his household, meanwhile Athene descends and lightly scolds Odysseus for not being grateful that his wife and son and house are within his reach, as well as his lack of faith that he will overcomes his enemies. 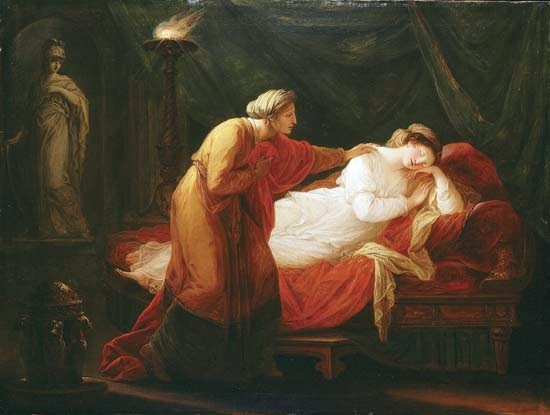 As Athene drifts slumber over him, Penelope is praying for the gods to end her life; she would rather be under the earth with Odysseus than have an inferior husband. Her husband hears her weeping and prays to the gods to send him an omen, both inside and outside, whereupon he hears thunder sent by Zeus and a mill woman prays for the suitors destruction. Telemachos rises and checks with Eurykleia that the stranger has been treated well, then she makes sure that the palace is ready for the suitors’ arrival for the public festival. Eumaios stops to speak with Odysseus but Melanthios mocks and challenges Odysseus, who gives no answer. Philoitios, an oxherd, then arrives, asking about “the stranger” and lamenting the absence of Odysseus and how the suitors ruin his household. Odysseus assures him of his master’s return, Eumaios prays for the same and Amphinomos reads an omen that Telemachos will not be murdered. The sacrificing begins and Telemachos commands that “the stranger” will be treated well, amazing everyone with his authority, and even Antinoös defers to his spoken wishes. One suitor, however, Ktesippos, protests at “the stranger’s” presence and hurls an ox hoof at him, which misses, causing Telemachos to praise the miss otherwise he would have had to stick him through the middle with his spear. Again, everyone is astounded at his command, and Agelaos tried to calm the situation, but then refers to the giving of Penelope in marriage. Telemachos states he would be willing to see her married if it was of her own free will, but since she resists, he will not force her. The suitors laugh at his words, but instead of a sincere laughter, it is as the laughter of men who have lost control and sounds most like a lamentation. Theoklymenos, disparages their laughter, prophesying their doom and leaves when they threaten him. They continue their boisterous mocking and jeering but Telemachos only looks at his father. Penelope listens outside the door. And yet there is still a sense that both the behaviour of Telemachos and Odysseus is a careful balancing act, but there is evidence, psychologically at least, that the scales are beginning to swing in their favour. This chapter shows the suitors at a disadvantage in their surprise at Telemachos’ mastery of situations, and evidenced by their hysterical laughter. While initially their mocking had a powerful ring to it, we sense now that their laughter is forced and purposed to cover up something. Could it be the advent of fear? Hmmm ……. Telemachos arrives home and Penelope bursts into tears when she beholds her beloved son. 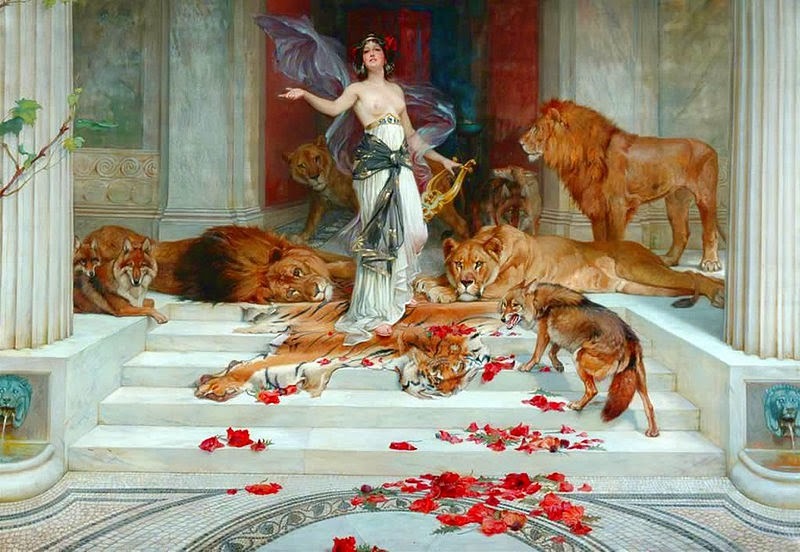 Telemachos begs her not to “stir up a scene of sorrow” and as he walks through the palace, Athene “drifts an enchantment of grace upon him.” The suitors appear to welcome him, while all the while planning his destruction, but Telemachos avoids them. Peiraios, brings the guest from the ship, and speaks to Telemachos about bringing the gifts from Menelaos, but Telemachos bestows the gifts upon him and ensures that the stranger is treated well. Telemachos relates his travels to Penelope and the portents for the destruction of the suitors and the return of Odysseus, whereupon the stranger, Theoklymenos, supports Telemachos’ story with confirmation of the omen. The suitors are amusing themselves before they turn to feasting, and Odysseus starts out for his home, on the way meeting Melanthios who is driving his goats and who taunts Odysseus with words indicating his sympathy with the suitors. He tries to knock Odysseus down but is resisted, and they exchange heated words before Melanthios leaves for the palace to sit with his favourite, Eurymachos. When the two reach the palace, Odysseus bids Eumaios to go inside while he waits outside, yet his dog, Argos, recognizes his master after 19 years (wow, a nineteen-year-old dog!). Telemachos immediately spies Eumaios, gives him some food to take to “the stranger” and asks that “the stranger” beg from the other suitors as well. Antinoös chastises Eumaios for bringing “the stranger” and Telemachos chides both of them. When Odysseus reaches Antinoös, he compliments him to get a bigger portion, then spins an elaborate story. Antinoös becomes angry with him, they have words and Antinoös hurls a footstool at Odysseus, striking him on the right shoulder. Not only Odysseus protests but so do the others, concerned that they are not showing the proper guest-host relationship, as one never knows if one is entertaining a man or a god in disguise. Penelope hears of the intemperate treatment of “the stranger” and summons him to her but Odysseus says he will come to her after the sun has set. Eumaios returns to his pigs but Telemachos instructs him to return in the morning. Telemachos cleverly advises his father to go begging from each of the suitors. 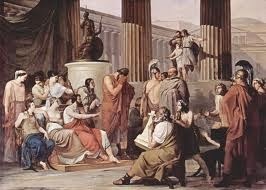 This act ensures that Odysseus will have better knowledge of his enemies when the time comes to strke. It is interesting to note that Athene must prompt Odysseus to go begging, perhaps evidence that the ruler of Ithaka’s pride has not been completely subdued, even if it means gaining the upper hand. Odysseus, on his way, is able to practice his self-control before he reaches the suitors. He does not react to Melanthios’ striking him, and even holds his temper against further verbal abuse. This practice allows him to control his anger against Antinoös when he reaches the palace, when Antinoös strikes him with a footstool. I can imagine that the anger is building inside him and the suitors will pay horribly for their rash actions. What is the implication of Telemachos’ sneezes? A beggar, Arnaios or Iros, challenges Odysseus, and Antinoös helps to stir up the situation. Odysseus elicits a promise from the suitors, not to interfer in their fight but when the suitors see his massive limbs, they predict a possible surprise outcome, and Iros is not so willing to fight, having to be pushed on by the suitors. Odysseus decides not to kill him but instead to lightly hit him and manages to break the bones in his neck, whereupon the beggar sinks to the ground, kicking and bleating. The suitors laugh at his plight. Amphinomos gives Odysseus his reward of meat and Odysseus compliments him, prophesying his fate through a speech, and Amphinomos is apprehensive. Penelope, now graced by Athene with further charms, descends and takes the suitors to task for their ill-treatment of guests, as well as her son who admits that he does not always take the wise course. Eurymachos tries to bring the subject around to the wedding of Penelope but she deflects his words with a story of Odysseus and tricks them into offering gifts, which pleases her husband mightily. The suitors give them willingly but Antinoös reminds her that they will not leave until she chooses a husband. As night comes, Odysseus offers to keep the lights lit for the serving women but one, Melantho, mocks and derides him, until he threatens her with dismembering, whereupon all the women scuttle away. Eurymachos then takes up the mocking of Odysseus, who counters with insults until Eurymachos tosses a footstool at him, hitting the cupbearer instead. This act incurs the wrath of Telemachos who gives them such a set-down, they are amazed at his bravado. Amphinomos upbraids them for their actions, saying that they must treat guests properly; they drink to the gods and then each goes home to bed. We have already seen the numerous crafty deceptions of Odysseus, and in this chapter Penelope echoes her husband’s trickery, cunningly wheedling out of the suitors, numerous gifts for their household. Telemachos, however, not only speaks with authority but appears to avoid falsity. Most of his speeches are direct and truthful. Athene finds Telemachos with “the glorious son of Nestor” and urges him to make his way back to Ithaka with haste and without delay. She spins an elaborate story about Penelope being ready to marry Eurymachos and tells him of the ambush that awaits. Leaving, she returns to Olympus and Telemachos awakes Peisistratos to inform him of the urgently needed departure. Peisistratos counsels that they wait until morning and when dawn comes, Telemachos informs Menelaos of their return to Ithaka. While Menelaos claims that he would never detain a guest if he wishes to go, he then proceeds to give gifts and prepare a dinner for Telemachos. Patiently Telemachos bears the good will of his host, and before their parting a portent is spied, an eagle with a great white goose in his talons that shoots by the right of their chariot. Menelaos begins to read the omen but Helen interrupts, claiming that Odysseus will return and take revenge on the suitors. On their journey, they sleep overnight at the house of Diokles in Pherai but when Telemachos and Peisistratos reach Pylos, Telemachos begs Peisistratos to make excuses to his father for him not coming to take his leave so he can leave immediately. He claims brotherhood with the son of Nestor, stemming from the love of their fathers and the common experience shared on their recent journey. Peisistratos agrees to attempt to placate his father and Telemachos makes ready to leave, quite obviously a different, more assured Telemachos than the one who first landed in Pylos. He is approached by a stranger, Theoklymenos, who asks for passage on his ship as he is being hunted, and Telemachos agrees to take him. Meanwhile, Odysseus is “making trial of the swineherd, to see if he was truly his friend and would invite him to stay on in his steading as he was, or would urge him to go to the city.” Odysseus asks for information about his mother and father and then Eumaios relates the story of his life, how he was stolen by Phoenician sailors and sold to Odysseus’ father Laertes. And as they converse, Telemachos lands his ship on Ithaka and soon after, reaches the swineherd’s hut. The story of Eumaios is rather touching. He grew up the son of a king, yet he was stolen and then sold as a slave into the family of Odysseus. In spite of his superior status, he worked faithfully all his life for the family, so much so that he claims Odysseus’ mother treated him nearly as a son. In addition, Odysseus has been gone for 20 years and the island has been leaderless. Eumaios could have attempted to return to his homeland, yet instead he faithfully discharged his duties to Odysseus and his family without complaint and with tireless industry. He displays truly amazing constancy and loyalty. Too funny! Menelaos, when hearing of Telemachos’ urgent need to depart, says he would not dream of delaying him, but then does precisely that. And poor Telemachos must endure the feasting and gifts even though he is desperate to leave. When he begs Peisistratos to make excuses for his not stopping to thank Nestor, one can tell this is something of a conundrum. Peisistratos “pondered the thought within him, how he could fairly undertake this and see it accomplished” and admits to Telemachos about his father, “how overbearing his anger will be, and he will not let you go, but will come him himself to summon you.” Telemachos wishes to tactfully avoid part of the guest-host relationship and the responsibility and respect he owes an elder but, as we can see, this is not an easy task to accomplish. We can see from Telemachos’ assured and confident behaviour, that he has found his identity while visiting Pylos and Laikdaemon and no longer needs constant support from Athene. His men follow his orders unquestioningly, and he has obviously grown into a respected leader. Odysseus hears footsteps and in walks Telemachos. Eumaios is thrilled to see his master, kissing him and weeping. Telemachos asks for news of his mother, as Odysseus rises to give him his place, yet Telemachos bids him stay. After eating, Telemachos asks Eumaois for information about the stranger (Odysseus), whereas Eumaios reveals that he will tell the “whole true story.” Telemachos is sorry that he cannot treat the stranger as he deserves because of the situation in his home, but instructs Eumaios to give him a mantel, tunic, sandals and a sword. Odysseus probes as to his inaction with the suitors and Telemachos explains more of their troubles. Eumaios sets off to give a message to Penelope that her son has arrived home and soon afterwards, Athene arrives with her golden wand, transforming Odysseus back to himself, and Odysseus reveals himself to his son. At first Telemachos does not believe him but soon he is embracing his father. Odysseus relates the story of his homecoming, then Telemachos gives his father information about the suitors as they devise their fate. Odysseus instructs Telemachos to return home and promises to show up there as an old man, yet he entreats Telemachos not to do or say anything if he is abused by the suitors. He instructs him to hide all the weapons in the house in a inner chamber, except for the ones they will need and to say nothing to anyone. Meanwhile, both the herald from the ship and Eumaios arrive to tell Penelope of her son’s presence on the island. The suitors are disturbed by the news and plot Telemachos’ demise, only a few refusing to take part. Penelope, hearing of their plans, alternately scolds and pleads with them to prevent their murder and Eurymachos assures her that nothing will happen to her son, even though his heart is plotting otherwise. Athene turns Odysseus back into an old man as Eumaios arrive back at the swineherd’s hut and Eumaios tells of seeing a fast vessel approaching the harbour, so they now know that the suitors who had lain in ambush have returned. Deception, deception and more deception. Oh, and a little less too! What irony when Eumaios initially tells of Odysseus’ “whole true story”, which really is not true at all. Odysseus first of all deceives his son with his identity but when Eumaios leaves, he reveals himself. Penelope is still deceiving the suitors and Eurymachos deceives her when he promises that he will not harm Telemachos, nor let anyone else do so. Telemachos is further establishing his identity as his character strengthens. It is obvious he is not the same hesitant boy who started out on the voyage at the beginning of the poem. His step is assured, his actions measured, and he even instructs his father on how they should test the men and women of their household. Those suitors had better watch out! 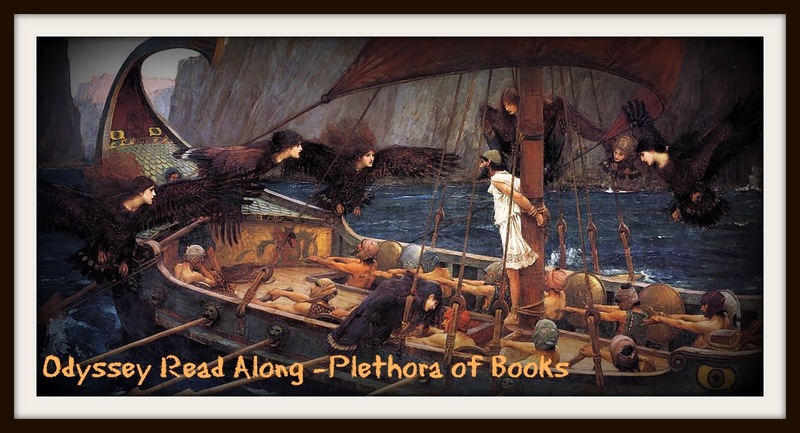 The Phaiakians give Odysseus numerous gifts, store them in the ship and set off for Ithaka. On the way, Odysseus falls into a deep sleep and does not even wake when the Phaiakians carry him on shore and leave him with his gifts on the beach. They return home but Poseidon is angry that they have helped our hero and, as punishment, he turns their ship into a rock in their harbour for all the people to see. A prophecy has been realized and, worried, Alkinoös vows they will never convey another man at the risk of making the gods angry. When Odysseus awakes he is furious, not recognizing Ithaka because of a mist Athene has put around him, and he think the Phaiakians have dropped him on a foreign island. Grumbling, his first thought is to check his treasure to make sure that they haven’t stolen anything. When Athene approaches as a man, he at first does not recognize her and asks if she can rescue his possession and him. She reveals to him that he has landed on Ithaka, whereupon he tells her a pack of lies about his journey and landing to cover his true intent, but then Athene turns herself into a woman and he recognizes the goddess. She lightly chides him in almost an admiring tone for his crafty, devious words. He reveals he still does not think himself in Ithaka, that she is teasing him but Athene confirms it again with words that are temperate, but speak poorly about Odysseus’ character. She lifts the mists and he now sees Ithaka; rejoicing he promises her gifts. They then hide his gifts within a cave, placing a stone over the door, and Athene transforms Odysseus into an old man for protection so no one will recognize him. She then departs for Lakedaimon to fetch Telemachos while Odysseus goes on to find his swineherd. As the story moves on, Odysseus’ character becomes more questionable. His majestically contrived words earn him many gifts from the Phaiakians, yet when he thinks they have left him somewhere other than where he requested, he is quick to blame them and then suspect them of treachey. He is the most consumate liar when he first meets Athene and even she, while appearing somewhat disgusted at his display, cannot help sounding impressed, telling him he could almost fool a god. He even appears to disbelieve Athene when she confirms he is on Ithaka, and she chides him then as well: “Anyone else come home from wandering would have run happily off to see his children and wife in his halls; but it is not your pleasure to investigate and ask questions, not till you have made trial of your wife ……” Yet we must not forget that Odysseus is in the gravest danger from the suitors if they realize he has returned. He must be intensely careful now in order to guard is life. Deception and disguise are his weapons at this point, and no one wields them as well as Odysseus! I’m trying to find out where these fit into the story and the importance of them. 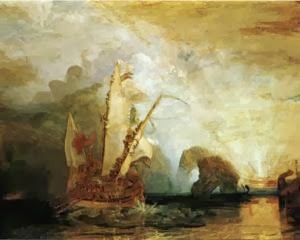 I do realize that they are connected to glory and honour and are therefore of the highest import, but Odysseus appears addicted to them, risking death at the hands of Polyphemus in the off-chance he could aquire some; in this chapter he is first of all worried that the Phaiakians have stolen some of what they’ve given him and when he meets Athene he says, “ ……. Rescue these possessions and me.” His treasure comes even before himself. Is this the normal Achaian love of fame and glory, in that wealth is directly proportional to status, or does Odysseus’ lust for goods contain something extreme and unusual for the culture? 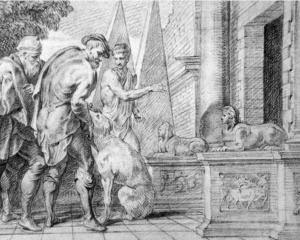 Odysseus finds his swineherd, Eumaios on the porch of an enclosure, but is attacked by his dogs. Eumaois calls them off and then takes Odysseus in as a stranger, offering him food and wine. While Odysseus eats, he tells him of the intemperate behaviour of the suitors and their lack of respect towards Penelope; as Odysseus listens, he contemplates the evil he will do these foul men. 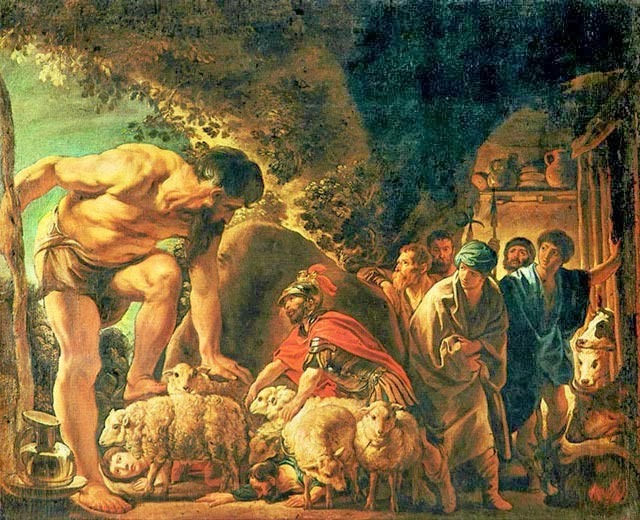 The swineherd praises his master and Odysseus is so impressed by his xenia and the way he has handled his goods while he has been absent, he assures Eumaios that Odysseus is bound homeward, yet the old swineherd does not believe his words. He gives further news of the suitors and how they plan to waylay Telemachos on his way home, with murder in their hearts. When he asks Odysseus his identity and from where he comes, Odysseus weaves such shocking tales full of deceit that even Eumaios does not believe him, showing wisdom in his scepticism. He laments that Odysseus had not perished in the war, for if he had, he would have won fame for his household. Odysseus, then seems to play a game with his servant to get him to give him a mantle or tunic: when the first ploy of asking for one in exchange for his information of Odysseus’ return doesn’t work, he later employs another duplicitous story to aid his devices, yet Eumaois claims there are no extra mantles, then helps to put him to bed under thick sheep fleeces, covering him with a mantle. Afterwards Eumaios goes out to watch the herds from a sheltered hollow of rock. The reality of the suitors’ actions must be getting more real to Odysseus as he comes closer to home. He now has from Eumaios a full account of their actions and while listening, he was devising their destruction. When Eumaios tells him of their intent to ambush Telemachos and murder him, Odysseus then really has no choice but to kill them all. I do understand why Odysseus feels it is necessary to lie and deceive to conceal his identity (for protection in this case), but the elaborate, florid, dramatic lies that he weaves ………….. well, are they really necessary? In this case, even Eumaios does not believe him. Perhaps, subconsciously, from working for Odysseus before he left for the Trojan War, he has learned to recognize falsehoods told by his master …….?? When Odysseus and his companions reach the city of the Kimmerian people, they make shore and find the place of which Circe had told them. Digging a pit a cubit in each direction, Odysseus pours in honey-milk, sweet wine, water and then sprinkles barley over it all. Promising a sacrifice when he returns home, he slit the throats of the sheep and lets the blood run into the pit as well. Ghostly souls surrounded the pit, “up out of Erebos, brides, and young unmarried men, and long-suffering elders, virgins, tender and with the sorrows of young hearts upon them, and many fighting men killed in battle, stabbed with brazen spears, still carrying their bloody armour upon them.” Odysseus gives the sheep to his men to finish the sacrifice, but he crouches with his sword by the pit, not allowing any of the ghostly apparitions to draw near until he has spoken with Teiresias. The first soul to approach the pit is one of his men, Elpenor, who had falled off the roof of Circe’s palace just before they had set sail. He laments that he was not buried or mourned, and pleads with Odysseus to return to Circe’s island to accomplish this task; Odysseus agrees. 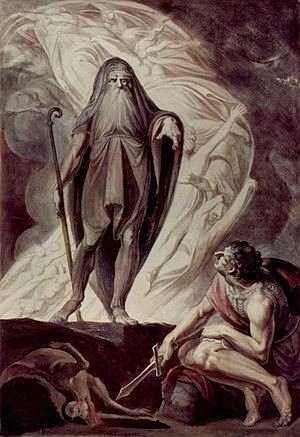 Next, he encounters the soul of his dead mother, before Teiresias the Theban appears before him and speaks a prophecy: Poseidon will make his homecoming difficult. If they do not eat the cattle & sheep of Helios, they may reach Ithaka, but if they do, only Odysseus will return, he will find troubles in his household and will have to punish with violence the men who have committed treachery there. After Odysseus sets his household in order, he instructs him to go on a journey where he will meet unusual men and there make a sacrifice to Poseidon. His death will be from the sea and “unwarlike” but in old age, and his people will be prosperous. Odysseus, while he listens to the instructions, is more interested in gaining information about his mother, but Teiresias says any who he allows to drink the blood will give him answers and then he fades away. 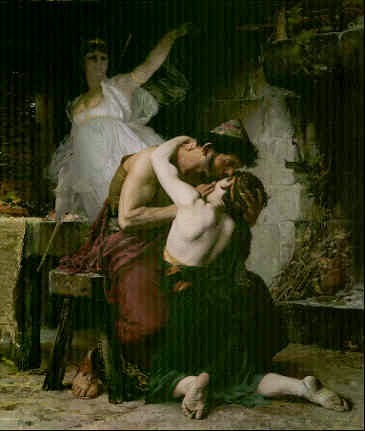 When Odysseus inquires of his mother how she met her death, she reveals that it was from pining away for him and, greived, he tries three times to embrace her but is unable to do so because of her state in death. After his mother, a catalogue of women come to him, Tyro, Antiope, Alkmene, Epikaste, etc. and the reader learns something of their history. The end of this catalogue brings Odysseus out of his story and back to the court of Alkinoös and the Phaiakians, but they urge him to continue, completely enraptured with his tales. He resumes his story of Hades, as Agamemnon steps up to the pool, lamenting the treachery of his wife and the untrustworthiness of women. Yet he then compliments the virtue and loyalty of Penelope, but cautions Odysseus to go covertly to his homeland. Achilles then comes, happy to receive information about his son. The soul of Aias, however, will not speak or approach him, still angry over the loss of Achilles’ armour to Odysseus. Odysseus tries to make restitution but Aias will have none of it and walks away. There is another catalogue of souls of men such as Minos, Orion, Tityo, Tantolos, etc . While Odysseus wishes to see more souls, a “green fear” comes upon him again and he returns to his ship. In the scene in Hades, in order to speak with Odysseus the shades must drink the sacrificial blood first, all except for Elpenor: he is able to speak without drinking Why is this? Is it because Elpenor was not properly buried and mourned and he is no longer of the earth, yet not able to reach Hades until someone rectifies the error? It would explain his plea to Odysseus. Agamemnon goes to great lengths to explain his murder and how it was brought about. He is particularly caustic towards his wife, vilefying her as “treacherous”, “sluttish”, “deadly” and “vile” and claiming that she would not even allow him a proper death ritual. He then goes on to praise Penelope, calling her “circumspect”, “virtuous”, and that her mind “is stored with good thoughts.” The comparison is striking, yet even so he warns Odysseus to return to his own country in secret. Leaving Hades, Odysseus and his men return to the island of Aiaia to give Elpenor a proper burial. Circe’s addresses Odysseus, revealing all the struggles which he will face on the way home, and what he must do to have a successful journey; then she gives them a fair wind to set them on their way. The first terror they face is the Sirens, “enchanters of all mankind”; no one can resist their song, yet the reward is to become part of the boneheaps of men on the beach. As per Circe’s instructions, Odysseus stops the ears of his men with wax and gets them to lash him to the mast. When the lovely Melody of the Sirens drift into his ears, he begs his companions to untie him, yet they only lash him tighter. After the crisis passes, their next challenge is to get past Scylla, and as Circe described her, she is a six-headed, twelve-footed monster with three rows of teeth and is “full of black death.” As Circe prophesied, she grabs six men with each head as they row by, and Odysseus reveals that he did not tell his men about Scylla because six men had to be sacrificed to her; had the men realized the danger, they would have stopped rowing and sought protection inside the ship. 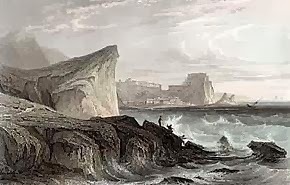 On the other side of the channel, the monster Charybdis is sucking and vomiting water, yet they make it through with the loss of six, and come in sight of the island of Helios, where Hyperion, the Sun God resides with his sheep and cattle. Odysseus counsels that they keep going but the men, led by Eurylochos strongly protest and he submits to their whining, making them swear an oath that they will not touch the sheep or cattle, knowing that if they do, as Circe foretold, that they will never make it home. But to their dismay, a South Wind blows for longer than a whole month, and as the men eat up the supplies, Eurylochos finally convinces them to take one of Helios’ cattle. While Odysseus is away, they butcher a fat oxen, using the justification that they will kill it as a sacrifice and then build a temple to Helios when they return home. Returning, Odysseus is horrified; his men all blame each other and, as Circe and the blind Teiresias prophecied, they are shipwrecked on their way out. All the men perish but, as he is pulled towards Charybdis, Odysseus manages to hold onto a fig branch until she disgorges two long timbers and he rides on these until he reaches the island of Kalypso. More and more examples of faulty or non-existent leadership abound. Why did they leave Elpenor without a proper burial? Odysseus is deceitful towards his men by not telling them that six of them will die while passing by Scylla. Is this strong leadership; is it the only way they will be able to pass this area and arrive home? Did Odysseus sacrifice six to save many? Is this right? And finally the men not only break their oath to Odysseus by eating the cattle of the Sun god, but they then blame each other when he finds out. As they struggle to find their homeland and attempt to emerge unscathed after numerous clashes with gods, monsters and fantastical creatures, are they losing some of the qualities that make them human? Are they becoming more like the world they are inhabiting? Odysseus finally reveals his identity and begins the story of his adventures on his quest to return to his homeland. First Odysseus and his men sack the city of the Kikonians at Ismaros, killing the inhabitants and taking their wives and possessions, but when the Kikonians bring reinforcements, the Achaians are driven away. Caught in the North Wind (caused by Zeus), they are swept along for ten days, finally landing in the land of the Lotus-Eaters. When the scouts Odysseus sends out, return “drunk” on Lotus and without the desire to return home, he ties them in the ships and they escape immediately, sailing until they reach the land of the Cyclops. After landing in an area far away from habitation, Odysseus takes his ship and men and goes to reconnoitre with a host of 12 companions. They find the cave of Polyphemus and, although his companions beg him to take the stores and fly away, Odysseus refuses, believing that if he meets Polyphemus, that he will give him presents. They are startled however, to see he is a monstrosity and they hide in the back of the cave until he spies them and asks their business. Only Odysseus is brave enough to answer, asking, as supplicants, for “guest presents or others gifts of grace, for such is the right of strangers” with respect to the gods. Polyphemus scorns the gods, stating, “we are far better than they,” and asks Odysseus after his ship. With crafty words, Odysseus claims they were shipwrecked. In response, Polyphemus grabs two of his men, “slapped them, like killing puppies, against the ground, and the brains ran all over the floor, and ate them.” Odysseus realizes there is little chance of them being able to push away the boulder in front of the cave, so he begins to devise a plan. They find a large olive branch and shave and shape it to a point, then draw lots to see who will attack the Cyclops. Upon the return of Polyphemus, Odysseus identifies himself as “Nobody,” plies him with wine and when he is sleeping, they shove the spear into his eye, turning it, “like a man with a brace-and-bit who bores into a ship timber.” The cries of Polyphemus bring the other Cyclops, who cannot get inside because of the boulder. When they ask his troubles, he answers, “Nobody is killing me by force or treachery!” Puzzled, they tell him he must be sick and return to their homes. Odysseus then concocts a brilliant plan to tie three sheep together and have one of men hang under each of the centre sheep. In this way they all escape, but unwisely Odysseus chooses to taunt the Cyclops when they are at sea, and twice Polyphemus hurls pieces of mountains at them, causing them to be pushed back to shore. Eventually they escape, but not before Polyphemus calls on his father, Poseidon, and prophecies death or troubles for Odysseus. The Cyclops does not recognize the code of hospitality. Is this because his father is a god and he does not have to worry about offending them? I don’t think so, based on what has happened to other children of gods. Are they reasonably remote and usually do not have to worry about visitors, because of their hideous appearance and deviant behaviour? This is puzzling. Yet again, Odysseus proves his ingenuity and bravery in the face of huge odds and terrifying circumstances. His speeches to the Cyclops were touched with manipulation, falsity and daring. His quick thinking and careful planning were instrumental in their escape. Considering his stubborn refusal to leave in the first place because he wanted presents, his actions were well considered, however he still caused the death of some of his men. 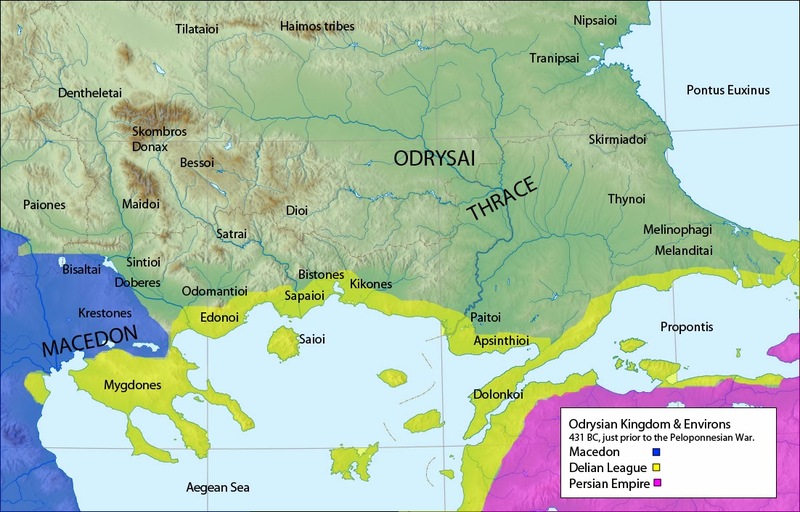 Originally I had thought of Odysseus as the king of Ithaka, but even if this term has been used, I’m beginning to conclude that it was a loose term. As I read on, I wonder if he could be more accurately described as a type of leader. There are instances of him refusing to listen to his men, such as the case of mocking the Cyclops and not leaving the island without gifts; yet there are also cases where his men don’t listen to him, as when he urges that they leave after the first battle with the Kikonians and, because of their stubbornness, end up in another battle and are subjected to casualties. Does this behaviour make the suitors behaviour at home less surprising? What was Odyssey’s role in his own country? 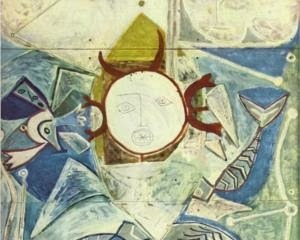 They arrive at the Aiolian island where Hippotas’ son, Aiolos lives. 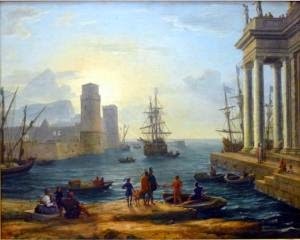 For one month he entertains Odysseus and his men and then gifts him with a bag “stuffed full inside with the courses of all the blowing winds” upon his departure. But lo, as the ships finally spy their homeland, the men begin to grumble about the greater portion of spoils that Odysseus has in his possession. While Odysseus sleeps from exhaustion because he would not permit anyone but himself to handle the ship, the men unwittingly release the winds which wildly blow them back to the island of Aiolos. In spite of Odysseus’ pleadings relating to the foolishness of his men, Aiolos is appalled to see them and sends them away, astounded that the gods are so much against them. Sailing, on the seventh day, they reach the citadel of Lamos and three people are sent off to scout. They encounter the daughter of Antiphates who sends them to her house, but there stands a woman as tall as a mountain, and when Antiphates materializes, he snatches up one man and prepares to eat him for dinner, while the rest flee back to the ships. The king raises the alarm throughout the city and these giants begin to hurl boulders at the ships, and spear men like fish as they go. Only Odysseus’ ship escapes and they reach the island of Aiaia, where Circe, the goddess who speak with royals and the daughter of Helios, lives. Odysseus and Eurylochos draw lots to determine who will reconnoitre the island and Eurylochos sets off with his men. When they find the house of Circe and she invites them inside; Eurylochos is the only one who refuses, suspecting treachery. His surmise is correct as Circe proceeds to lead the men into pig pens and transform them into pigs. Eurylochos hastens back to tell Odysseus of his mens’ sorry fate. Odysseus decides to face Circe on his own and on his way he meets Hermes who tells him how to best the goddess and gives him medicine to help counteract her potion. 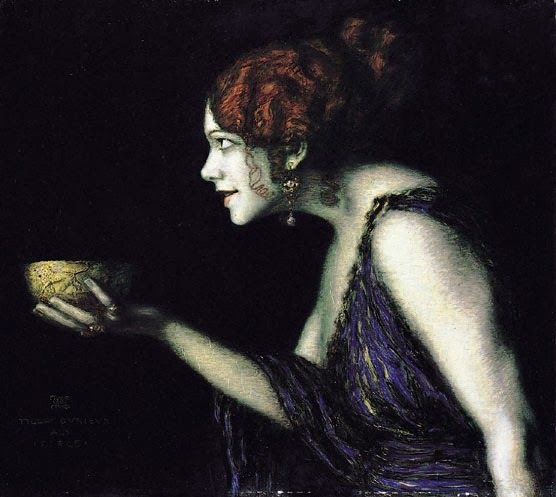 When Circe hands him the drink, he swallows it and, leaping up, draws his sword and springs at her as if to kill her. Astounded that the mixture has had no affect on him, she invites him into her bed, whereupon he forces her to swear that she will practice no more treachery upon him. She washes him, yet he refuses to eat before she sets his men free, which she does with a command to go back to his camp to bring back the rest of his companions. They cry and weep for joy when they see Odysseus return, but Eurylochos attempts to prevent the men from visiting Circe; Odysseus contemplates killing him but is restrained by his men, and Eurylochos, afraid of being left behind, follows. For a year, they feast daily on “unlimited meat and sweet wine,” until Odysseus cannot bear it and clasps Circe’s knees, begging her to allow them to resume their journey. She agrees but imparts a surprising stipulation: Odysseus must visit the house of Hades and speak with the soul of Teiresias the Theban and blind prophet before his quest may continue. She gives him directions and instructions for sacrifice when he arrives there, then sets him on his way. Is it my imagination or is the chain of command seriously compromised? First, upon sight of their homeland, the crew becomes jealous of Odysseus’ spoils, and secretly opens the bag of the winds, which blow them back to where they started. Their envy of his treasures is palpable and their actions, mutinous. Eurylochos, in spite of being elected leader of the reconnaissance expedition to Circe’s house, chooses not to go inside with his men. Was that jettisoning his leadership responsibilities? Did the men refuse to listen to his guidance? And when he was the only one to make it back to the ship, he was a nervous wreck, refusing to return, even when Odysseus came for them, assuring them everything was alright and that Eurylochos’ men were restored to their origin form. Odysseus wants to decapitate him for his insolence and has to be restrained. Was this because Eurylochos attempts to influence the men directly, without speaking to Odysseus first? Either they are suffering from a slow breakdown of leadership, or the society of Ithaka is sufficiently lawless that there is room made for actions that challenge the chain of command. The breach of xenia, or the tradition of guest-host hospitality, continues. The Phaiakians disliked strangers and entertaining them, the Cyclops wanted to make meals of them and mocked that his “gift” to Odysseus was that he would eat him last, and now the Laistrygonians attempt to eat them, and Circe turns them into pigs. Are these lands so far from mainland Greece that they don’t recognize this tradition? Athene puts a deep mist about Odysseus so the Phaiakians cannot see him and then meets him at the entrance to the city in the guise of “a young girl, a little maid, carrying a pitcher.” She cautions him against drawing attention to himself as the people of this country do not like strangers or entertaining them, and also gives him some helpful background information with regard to Alkinoös and his wife, Arete. When he reaches the palace, he finds the king and queen and, as Nausikaa instructed, grasps the queen by the knees. It is at this point the mist is removed from him and all the people gathered gape at this stranger in a pose of supplication. When he goes to sit in the ashes of the hearth, they raise him to a place of honour, feed him and he recounts generally of his suffering. When they inquire as to how he acquired his garments (Arete recognizes them), Odysseus offers the truth of how they came into his possession, but honey-coats his explanation so that Alkinoös is impressed instead of offended, and actually offers him Nausikaa in marriage. Odysseus has yet to reveal his identity. I wonder why he feels the need to conceal himself. He also cleverly avoids answering Alkinoös’ offer of his daughter. “Friend, that was not well-spoken; you seem like one who is reckless. and people look on him as on a god when he walks in the city. would make it otherwise, and yet the mind there is worthless. Rising, he grabs a discus and far out throws anyone who has yet competed. He then boasts of other feats he is capable of, and mentions the Trojan country where he was; when he finishes his speech, all men are “stricken to silence.” To lower the tension, Alkinoös suggests dancing with more story-telling, and Odysseus watches the performance, at the end conceding the superiority of their dancers with an eloquence and diplomacy that wins admiration. Alkinoös promises gifts to Odysseus, and even Euryalos gives him a sword. Nausikaa reminds him of her rescue of him, and wishes for his kind thoughts of her in his homeland, whereupon he charms her again with words and finally he offers Demodokos the best portion of his meat. The singer, pleased, begins to sing of the Argives and their means of gaining the inner city of Troy inside the Trojan horse. 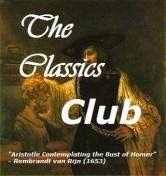 Once more Odysseus sobs his heart out in sorrow, and Alkinoös, watching, finally directly asks for his history. 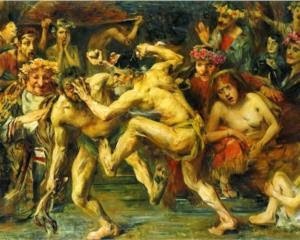 The Phaiakians were looking to win the admiration of Odysseus with their contests but, when it becomes apparent he can best them at most sport, they then turn to dancing, an area in which they prove their supremacy. They want him to carry home a tale of an exploit in which they could impress foreigners. Still Odysseus conceals his identity and, instead, strategically employs diplomatic and persuasive speech to win their respect. His survival, in this case, perhaps does not depend on weapons, but tact and ingenuity. His politeness reflects much more on his character than actions. After hearing the Phaiakian songs of the Trojan War sung by Demodokos, will Odysseus feel more comfortable with revealing himself? These are a curious people and are difficult to characterize. Their kingdom is far away from others, and they do not seem to welcome strangers in the same manner as other countries. They are not completely unsophisticated, yet there are clues that they are not as advanced as other nations. A prime example of this is when Euryalos almost apologizes for his gift sword being merely made of bronze, but then points out that the handle is silver and the scabbard of ivory. Could their possible inferiority also be the reason that they want Odysseus to carry home a story of their aptitude and excellence in a respected arena, such as sports or dancing?